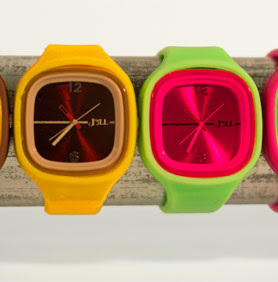 Girly Girl Giveaways: J3LL Watches Review and Giveaway! J3LL Watches Review and Giveaway! This would make a great Christmas gift, after all its only 3 months away! J3LL has been kind enough to give away 2 watches to one of our followers ! Mandatory ENTER:Leave a Comment On GGG For each :Like J3LL on Facebook ,Follow them via Tweet & tell us what 2 colors you would Love to have . to find our lucky winner ! YA WE HAVE A WINNER! #25 Liz Barragon ! Congratulations . I will be emailing you information on your giveaway prize ! Following on FB , hope I win these J3LL watches !! so sick ! I like the purple, but I'm sure my daughter would like the pink! following them on twitter as jhitomi. I like the White and Rose clocks. I like the Pink & Purple Colors! Love the purple & pink J3LL watches .. zmeldes@yahoo.com..hope I win !! I now like J3LL on Facebook. Now following J3LL on twitter. I like the brown and green. I follow GGG via email. I follow GGG via twitter. I think I would get the white for me and the orange for my 15 year old daughter. 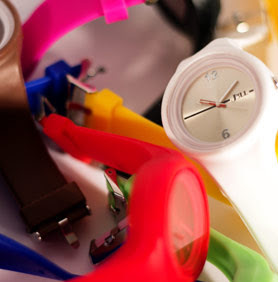 I LOVED Swatch Watches. Lol. Thanks for the chance to win such great watches and for the blast from the past with the thought of Swatches. Lol. Following on Twitter & Facebook. Sweet looking watches. I really like the White Rock and Dark Blue Rock...passing the word for sure! I like the purple and the pink. I Subscribe to GGG Via Email. I Like GGG on Face Book.